Insulin Delivery Devices Market size is set to exceed USD 19 billion by 2024; according to a new research report by Global Market Insights. Increasing prevalence of diabetes and adoption of insulin delivery devices are the major factors driving the global market. Rapidly growing demand for needle free minimally invasive delivery system fuels market growth and should significant augment the overall industry expansion in foreseeable future. Rising diabetes diagnosis rate worldwide, especially in developing countries is generating demand for insulin and thereby delivery devices. Furthermore, insurance coverage and reimbursement by public sector organizations for diabetes management in number of countries will favor market growth. Growing awareness about early disease detection along with increasing availability of delivery devices will positively impact insulin delivery devices industry growth over the forecast period. However, high cost of insulin and associated devices will continue to abstain patients from regular and optimum management of the disease, especially in resource poor regions. Insulin pens’ business segment dominated the market in 2017, valuing over USD 6.6 billion and is forecast to hold its position by 2024. Within the insulin pen business, reusable pens will growth with CAGR more than 6.5% during the forecast period. The demand for injection free minimally invasive systems will drive pumps’ market growth over the forecast timeframe. Factors such as, ease of use, needleless insulin delivery and portability will result in rapid adoption of the same in coming 5-7 years. The insulin pumps market is forecast to grow with CAGR of over 7% during projection years. 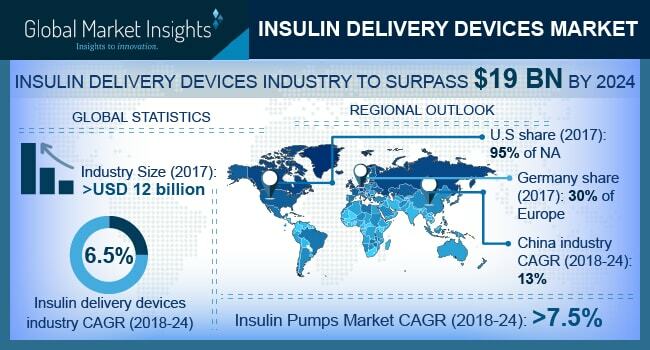 UK insulin delivery devices market valued over USD 500 million in 2017 and is forecast to grow with a commanding CAGR during the projection years. Demand for insulin pens happens to be high across the nation; however, demand for pumps, which has been lesser popular devices, should rise significantly over the forecast timeframe. India insulin devices market should witness 13.5% growth owing to high number of diabetic population being untapped and increasing incidences of the same. Improving healthcare system, growing disposable income and awareness will be some of the major factors driving market growth. China insulin devices market will be the largest by the end of 2024, growing with a CAGR of over 13% from 2018-2024. With nearly USD 25 billion diabetes care expenditure, the country is targeting diabetes management better than any developing nation across the globe. Some of the key industry players operating in global insulin delivery devices market are Eli Lilly, Sanofi, Novo Nordisk, Beckton and Dickenson, Roche, Medtronic, Insulet Corporation and Ypsomed. Specialized devices manufacturing companies such as Insulet Corporation focus on novel product development; innovation is their major stranger to gain market share. On the other hand, established bigger companies focus on geographical expansion, merger and acquisition to expand their foothold in the industry.